As we start Easter week, I wanted to post a photograph that depicted a reflection of Jesus. Jesus died on the cross for our sins. His blood ran red, and He died a horrific death. 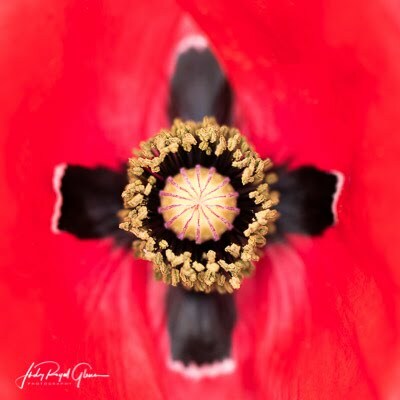 Note the cross in the middle of the poppy with its flowing marks on the right side as though blood flowed down. The good news is we celebrate Easter because He rose again! If you don’t know Him personally, that is my prayer for you. I couldn’t do it without Him! I love visiting Magnolia Plantation and Gardens in Charleston, South Carolina. I usually spend the day in the Audubon Swamp there. 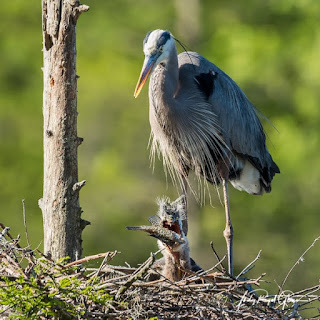 A great blue heron typically has a nest on a cypress tree in the swamp, so I was eager to see if there was one again. This year, I only saw one chick. He was very hungry and constantly called to his mom for food. At times, he lulled her to sleep. She finally gave in and regurgitated a ginormous fish. The chick wrestled with the fish for a long time. He tried and tried, but he could never swallow it. Finally, she bent down and tugged on the fish that was sticking out of his mouth. He did not want to let go, but mom had her way and took it from him. She knew it needed to brew for a little longer. He clamped down on her beak trying to get her to release the fish again. After more complaining, she relented. This time he wasn’t going to let her take it back. He gulped it up right away. It was funny, seeing the huge fish lodged in his throat. It made him look like he had a very thick neck. 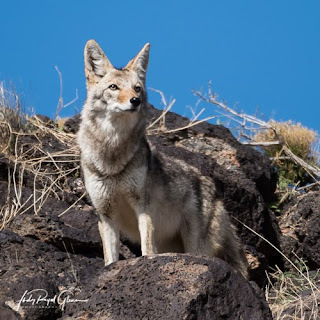 Last week I posted a posed coyote. 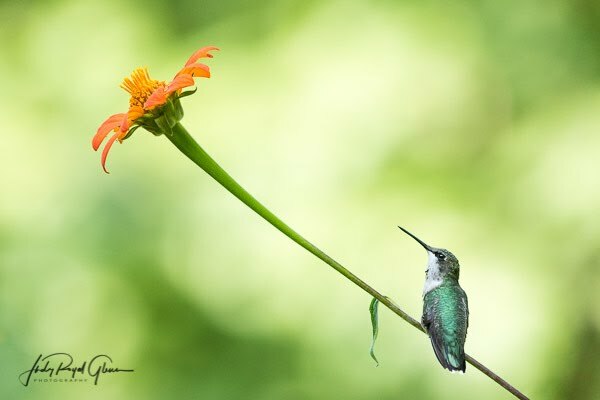 This week I am posting a perfectly posed ruby-throated hummingbird. They are back in Athens, and I am tickled pink. I saw my first one five times yesterday. Bring it on!! When we visited Albuquerque last week, I knew I wanted to photograph the wildlife. 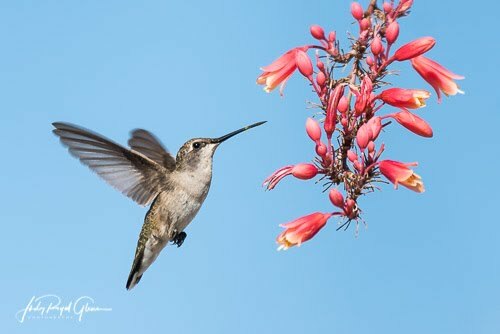 After doing a little research, I knew it was a tad early for the hummingbirds. I went to the Rio Grande Nature Center State Park and was lucky to see a small flock of sandhill cranes migrating through. While I was there, I talked to a worker in the visitor’s center and asked him where he suggested I photograph wildlife. He mentioned I could find coyotes and long ear hares at the Petroglyph National Monument. Large black volcanic rocks were scattered throughout the park and were decorated with petroglyphs. We visited the Piedras Marcadas Canyon, which hosts 300-500 petroglyphs. I was mesmerized by the petroglyphs and thought of the people who made them. We did see the hares, but they were super skittish and ran away one hundred miles an hour. While I was photographing a petroglyph, my husband said, “Judy, there is a coyote!” I glanced up to see a coyote meandering down the large boulders. He was looking for food. He posed frequently. He even posed with his fresh catch—a mouse. I’ll have to post that photo for another day. This photograph is one of my favorites. I don’t have much of a green thumb, but I am super glad I planted Mexican sunflowers for the last two years. They are critter magnets. 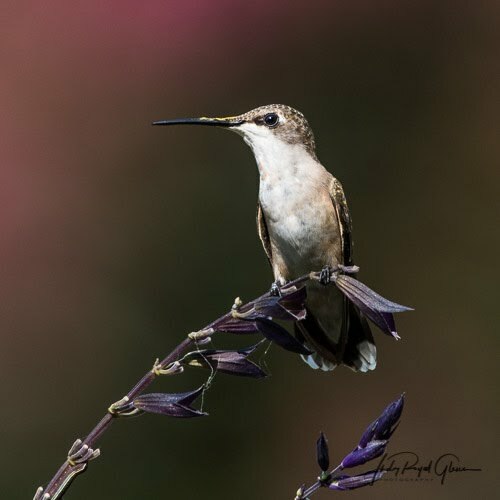 The ruby-throated hummingbirds feed off the nectar and use the branches as a guard tower. Even though I had three huge plants, this hummingbird hardly tolerated any visitors to “his” plants. 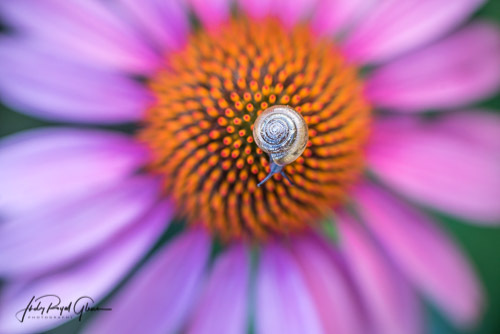 I was able to photograph this little guy from a hide in the basement of my house. A sheet draped over the open window gave me the perfect advantage point. All I had to do was wait. I love how he is gazing at the lone flower above him, but in reality, I think he was looking for an intruder. 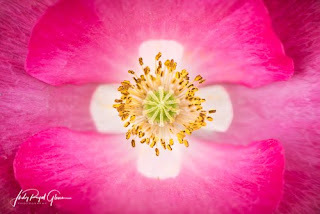 My friend Heather and I like to shoot at the State Botanical Garden together. We are ready for spring to get here so we can go shoot again. As we were walking along, she found this little snail. For the next thirty minutes, he happily joined us on our excursions as we let him visit several flowers. He enjoyed his trip and was an excellent model! Last year was my first year raising monarch butterflies. It was a lot of hard work but well worth it. One of my greatest joys in raising them was releasing two different butterflies in honor and memory of two young men. Their lives were taken at a young age. The male monarch butterfly in this video was named Jon, in memory of Jon Desso. Jon was a nice Christian young man that attended the school where I taught. His mom, Jane, taught my daughter when she was in the second grade. I placed a small circular tag on Jon’s butterfly, which has three specific letters and numbers to track his migration to Mexico. Monarch Watch distributes these tags and the data collected aids in research. Jon’s tag numbers are ZEU 860. Happy birthday in Heaven Jon! I am glad I could honor you in this way. While I was birding on Grand Cayman Island, our guide took us to a pond where we found a female West Indian Whistling Duck and her three ducklings. These ducks are nocturnal and feed mostly in the evenings, yet the Lord had them out feeding the morning I was there! 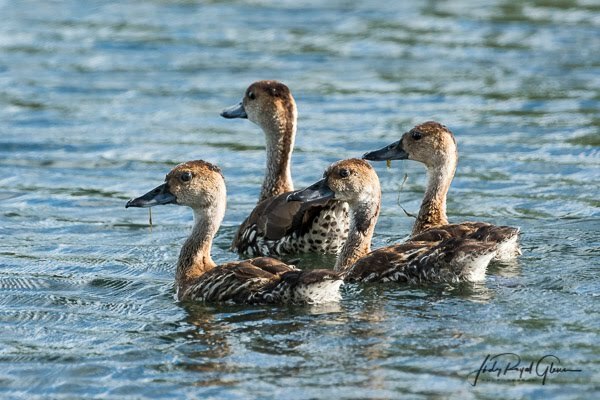 The Bahamas National Trust website says, “The West Indian Whistling Duck is the largest and rarest of the 8 species of unique whistling ducks found throughout the worlds tropical regions.” They are also one of the two rarest ducks in the Western Hemisphere. I am glad I had the opportunity to see them. Don’t you just love their white feathers with brown polka dots? While I was in El Paso, Texas, I visited Chamizal National Memorial Park in search of hummingbirds. I did my research and was hoping it would pay off. Boom Baby! They were feeding on the Texas Red Yucca. I sat at the base of this plant for almost three hours and loved every minute of it! 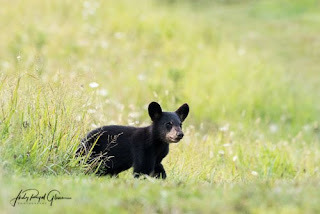 I photographed a sow and her cubs in a field at Cades Cove for about an hour and a half as they foraged for food. The field was decorated with Queen Ann’s Lace and the grass was tall, which made it difficult to photograph them, so I sat on the roof of my SUV to get a better shot. Then I saw the perfect opportunity to get the shot I really wanted—the bears were headed towards a freshly cut path. It took them a while to get there, but one by one they followed ma. He looks a little timid in this image because there was a large crowd awaiting their arrival. Ma was right there though—her back paw is just out of the frame. If you look closely, you can see the ear of its sibling in the tall grass. My mouth was agape as I saw the intricate details inside the poppy—a stunning white cross. How beautifully crafted did the Lord create everything! On this Valentine’s week, consider the greatest love of all. It did not come packaged in a box of chocolate candy or red roses it came when Jesus died on the cross for you. Since Valentine’s Day is this week, I wanted to post flower photos. 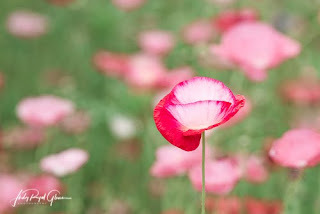 This one poppy stands among a whole field of others. In and of itself, it is beautiful, but with the other flowers around it, the scene becomes even prettier. You are one in a million too and you are special. Stand tall and shine. The outside isn’t what is important—it’s what is on the inside! I can’t wait to share with you Wednesday’s post! This summer, an immature red-billed streamertail hummingbird thought he was king of the mountain in Jamaica, but he is only a prince. Once he is full grown, maybe he can be king. 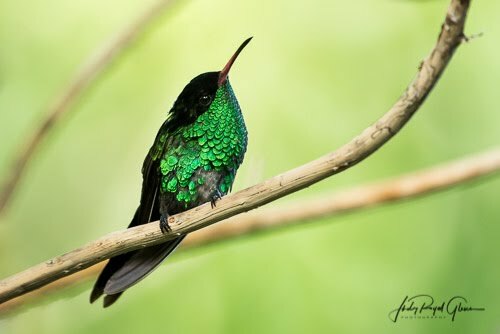 This stunning black and green little gem can only be found in Jamaica and is their national bird. His tail is short and has not fully grown to the adult’s length of 6-7 inches, and he is missing quite a few iridescent feathers on his chest because he is molting. They have the longest tail feathers of any hummingbird. The locals call them the “Doctor Bird” because their long tail and black crest resemble the doctors of ole. If you would like to hear their beautiful song that I recorded three years ago, you can find it on my YouTube page—Judy Royal Glenn or click here. 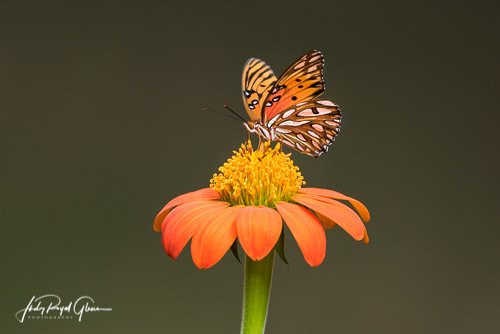 Gulf fritillary butterflies are also called passion butterflies. The passion flower is the host plant in which females lay their eggs. The female fritillary butterflies are generally slightly larger, have more brown markings and are usually darker in color. A long wooden walkway meanders through the rookery at the St. Augustine Alligator Farm Zoological Park in Florida. At the end of the boardwalk was a great egret nest. I was mesmerized as I watched three chicks in the nest. The little guys can be fierce with each other. I don’t like thinking about the dominant chicks and how they can end up stabbing the little ones to death. Most of my time photographing was spent at this nest. I probably could have stood there all day, but I wanted to also photograph the spoonbill nest.